“Asterix and the Magic Cauldron” is based on the characters and the world of the “Asterix” comic books. 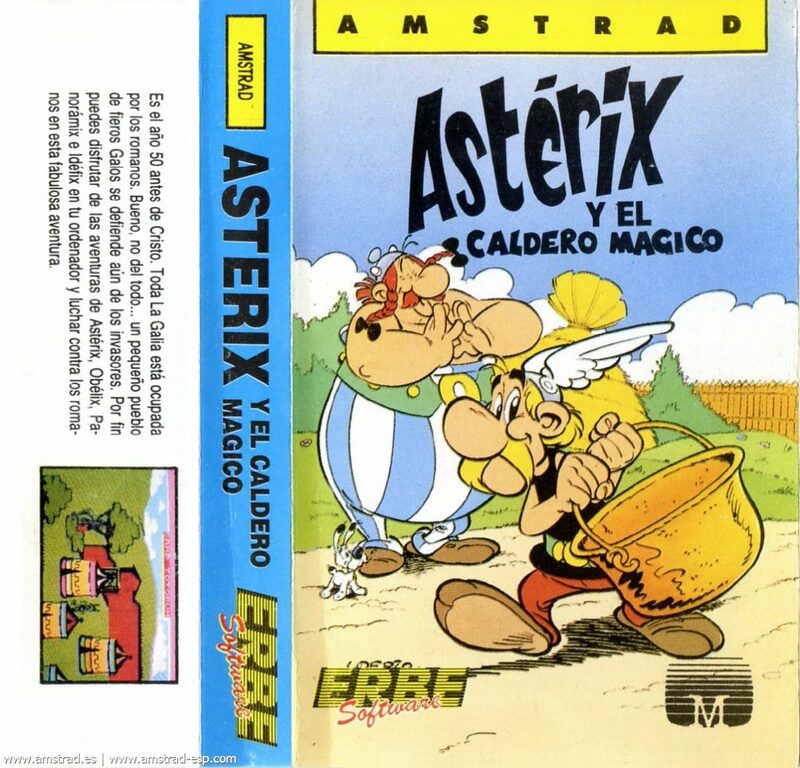 The aim of the game is to take Asterix and Obelix on a journey to collect all seven pieces of Getafix’s broken cauldron. 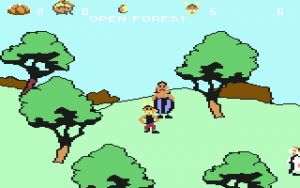 Asterix needs to carry food, for Obelix to follow him. 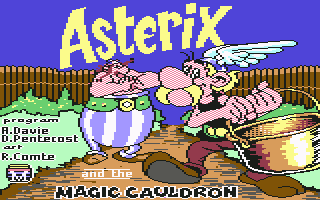 Asterix and Obelix explore and fight their way across occupied Gaul, in search of the missing pieces. “Basically a matter of exploring thoroughly in order to find the cauldron pieces. Obelix will follow Asterix anywhere, but he must be kept nourished with his favourite food: wild boar. 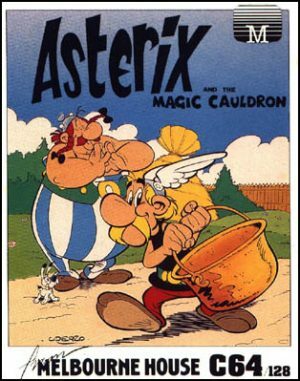 Asterix has five roast boars with him (how does he carry them??) and one disappears each time Asterix and Obelix get hungry. When they are all gone, Asterix has to find and fight a boar – the fight sequences take place in windows that zoom out of the main screen. 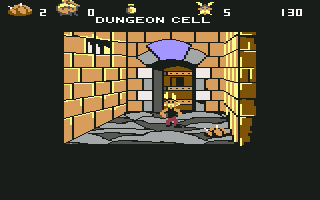 Stamina bars for each combatant appear on the side of the window. 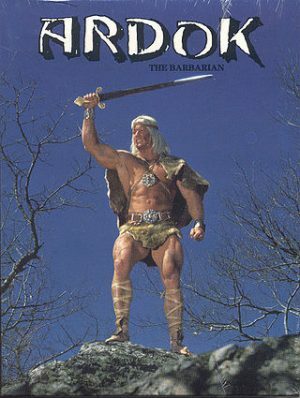 Defeating the boar adds it to the food tally. If Asterix loses the fight he is kicked out out of the window and he loses a life. 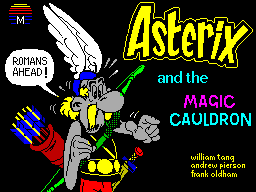 The same system is used when fighting the Roman soldiers and when Asterix picks up useful objects along the way. The review concluded that it was a very disappointing games. Very good looking but overall a disappointment with “Crash” Magazine at the time awarding it only 61 out of 100 possible points. 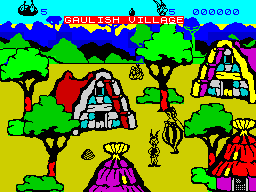 In part the reason that the was so disappointing was games was that one of missing pieces of the cauldron that players has to collect was inadvertently left out of the final build. It is a testament to how players endured with difficult and buggy games at this time – often assuming that the issue lay with them rather than the game, that the game sold OK. 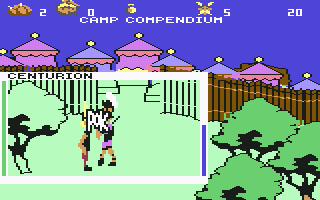 The Spectrum Walkthough by odino at gamefaqs.com only explains how to discover five pieces whilst the game instructions clearly state there are seven missing pieces. 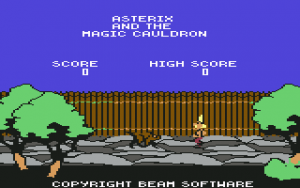 “Asterix and the Magic Cauldron” is licenced with Dargaud (Belgium), creators of the “Asterix” comic. 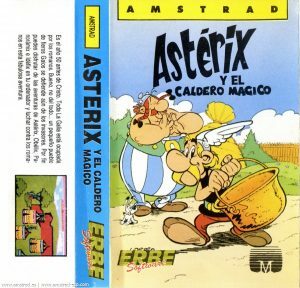 Alfred Milgrom approached the publishers of “Asterix” – Dargaud – to get permission to make an “Asterix” game. Rights were cleared only for Europe, the United Kingdom and Australia. In America the game was published as “Ardok the Barbarian”, with different sprites. This version does not suffer from the same bug.